A soft feel and elegant aroma.A sacred and deep, complex beauty. The flexibility and suppleness to last 1,000 years and more. a unique item produced in Japan since 1,000 years ago. and culture of Japanese people over the years. preserving things in their natural form. 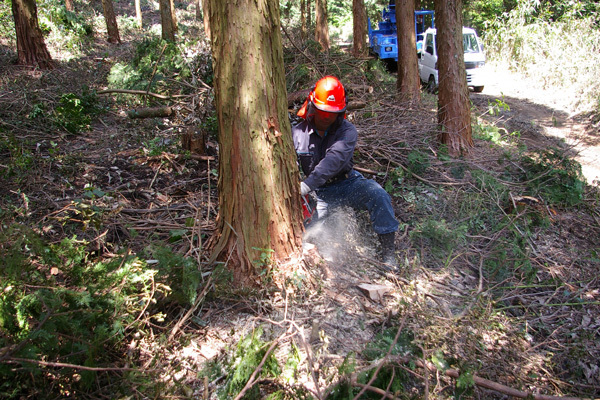 Hinoki cypress is, we feel, an abiding testament to this culture. its power seems to cleanse and purify us in mysterious ways. Like the freshly fallen snow, it is graceful and heart-warming. and ETO’s mission is delivering it to the world. Hinoki (Japanese cypress) is a large evergreen tree that is native to central Japan. With deep green, glossy leaves and a unique fragrance, hinoki boasts world-class qualities due to its ease to work with and durability lasting over 1,000 years. Hinoki was used as a building material for many palaces and is described as a “good tree for building palaces” in the Nihon Shiki, one of Japan’s oldest books. After over 1,000 years, hinoki continues to play an important role in modern living and connects us to the future. Hinoki is described in the Nihon Shiki, one of Japan’s oldest books, as “a good tree for building palaces” and was widely used to construct imperial courts, government offices, imperial gardens, shrines, and temples. There is a theory that the name “hinoki” comes from the Japanese phrase “hi no ki (tree of the sun)”, the sun representing the highest being at the time, as hinoki was used to construct palaces and “should be the tree for palaces” according to the Nihon Shiki. The entrance of a palace constructed with hinoki is referred to as an “entrance to the sun” in the Manyoshu. Hinoki is regarded as a high-class building material for funeral equipment in both Shinto and Buddhism. 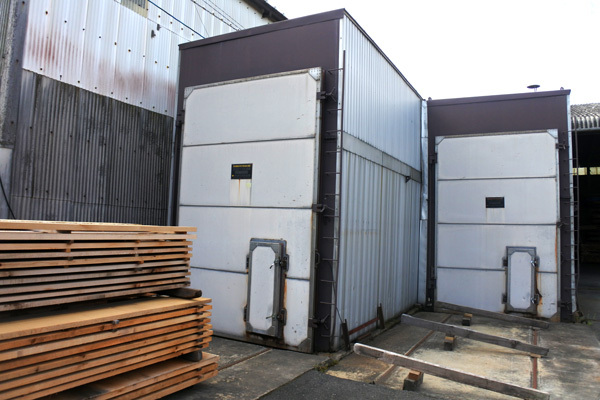 It is thought that unvarnished hinoki wood (plain, stripped wood with no coating) was used for items such as box shrines, round roofs, and Kojin (god of fire) boxes because its clean appearance was associated with the gods and solemnity. 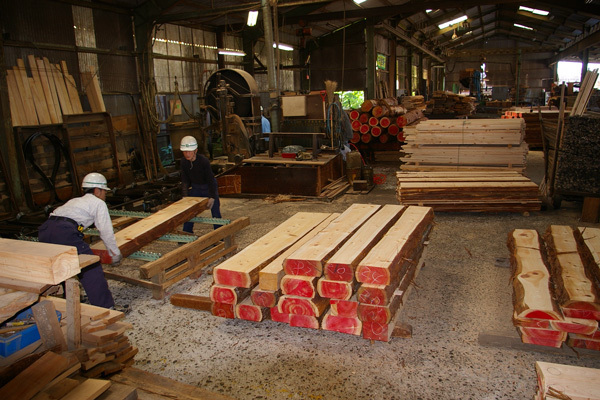 Hinoki has been used in projects as big as the Giant Buddha statue in Nara to objects as small as the wood for matches. An important tool for expressing Japanese “tree culture” over the years, hinoki is expected to continue to feature in Japanese everyday life. Hinoki has been used since ancient times as a building material for temples and shrines. It has impressive durability and is said to become stronger 200 years after being logged and only gradually become weaker after 1,000 years. 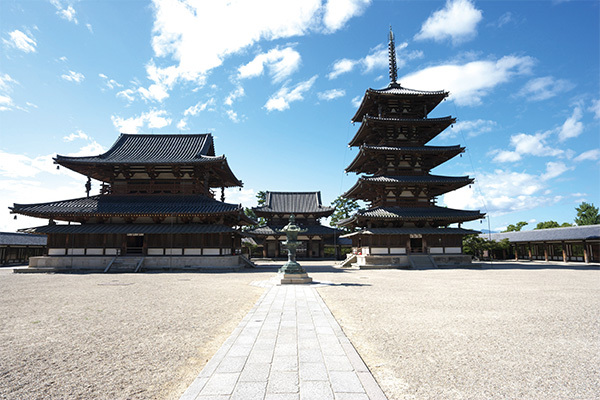 The pagodas of Horyuji and Yakushiji are widely acknowledged to be the oldest wooden buildings, still standing at 1,300 years after their construction. Hinoki is a very culturally important tree to Japan and is used in unique religious festivals such as Ise Shrine’s Shikinen Sengu in which shrine buildings are rebuilt every 20 years. Hinoki wood is beautiful white with a hint of red, is smooth to the touch, and has a unique sheen and fragrance. Its has an extremely fine grain and durable core and holds up well in humid environments. Hinoki is used to make bath tubs and well buckets due to its resistance to water and humidity and is particularly loved by Japanese people as a high-grade bath tub material for its calming scent. Hinoki is used for a variety of everyday products thanks to its strength, lack warping, durability and light-weight and softness. Because wood is hygroscopic, it constantly contracts and expands as the amount of moisture it absorbs increases and decreases due to changes in the humidity of the air around it. As a result, most wood warps, inverts and splits. Hinoki, on the other hand, is soft and has a fine grain so does not easily warp, leading to its wide use in the base materials for lacquer wear, home shrines, statues of Buddha, small sculptures, and cutting boards. Warping generally occurs, and to a larger degree, in broad-leaved trees rather than conifers and soft woods are said to warp less. 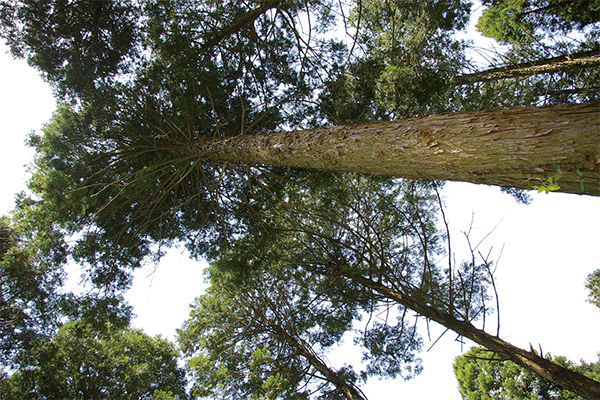 Hinoki has been used as a material for religious items because it is both a conifer and a soft wood. Depending on the species, wood has a unique fragrance or smell. That fragrance or smell may be strong in fresh wood but becomes gradually more faint when the wood is dried. Hinoki, on the other hand, has a long-lasting fragrance which makes it a popular choice as a construction material. Most people, when they think of “the smell of hinoki,” recall a calming scent. 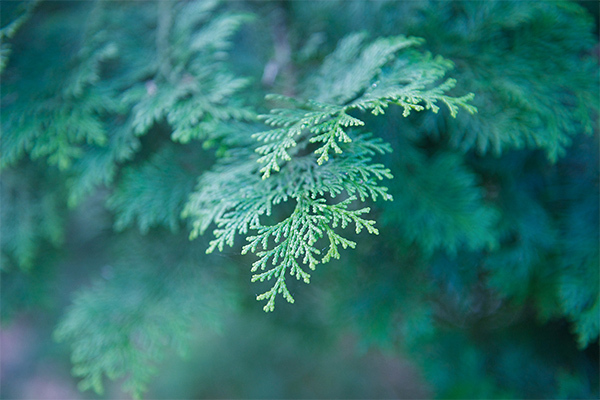 It has been found that the phytoncide in hinoki has both a strong antibacterial and stress-releasing effect. As hinoki’s fragrance lasts after logging and drying, it boasts many effects such as calming autonomic nerve activity, relaxing, reducing irregular pulse rate, and aiding good sleep. When entering a forest, we should be able to smell the strong smell of animal corpses and waste. The reason we don’t smell these things is the deodorizing and air purification effects of phytoncide. 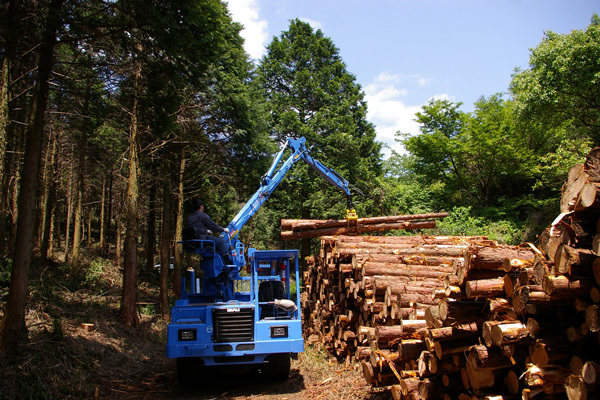 This effect of phytoncide lasts after wood such as hinoki has been manufactured into wooden products such as furniture and construction materials. Living in a wooden house or being surrounded by wooden rooms and furniture is said to have the same effect on us as a forest. As phytoncide is a safe, natural substance, it is safe to use in homes with children. “Wooden living”, a long tradition in Japan, features the wisdom of our ancestors who cleverly utilized the power of phytoncide. Hinoki has anti-mold and antibacterial properties. Its humidity regulation function suppresses the formation of mold and bacteria growth, making it the perfect choice for sushi restaurant counters and and serving plates for sushi. Hinoki’s fragrance producing substance has also been proven to continuously control mites. These characteristics make it a great choice for products in the home. The Ministry of Agriculture, Forestry and Fisheries Research Lab has stated that “the fragrance of hinoki is effective in preventing mite growth.” The Ministry’s report reveals that spreading hinoki shavings while cleaning carpets prevents mites as it suppresses the movement of mites while the fragrance is still detectable. Mites, which live off human skin, dirt and mold (such as dermatophagoides farinae and dust mites) can increase 100 fold in one month and cause allergic reactions such as asthma and rashes. However, mites bred in the shavings of hinoki leaves and hinoki wood died within a day. Spreading hiniko shavings around the home before vacuuming will prevent the occurrence of mites while the fragrance of the shavings is in effect. Using new technology to touch peoples’ lives. For more natural, people-friendly drying. The cypress used for construction and that used for furniture have different water contents. Wood used for construction generally has a water content of 20 percent, the standard for what is known as “seasoned timber”. Wood used for furniture, on the other hand, has a further reduced water content of 15 percent. Freshly cut wood contains a large amount of moisture, and if used as is, is susceptible to deformation and shrinking, which in turn results in bending, warping, and cracking. For this reason, it is important to remove this excess water content. 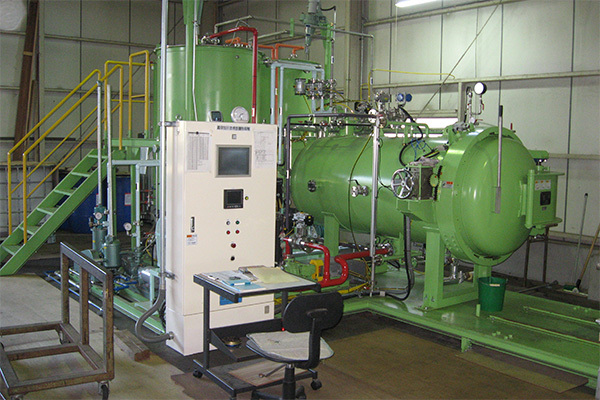 Eto reduces the water content of its wood even further than is usual. Our reason for doing so is that, when furniture store staff or customers assemble our furniture, any warping or creaking could cause difficulty or even injuries. It is our belief that, for a product intended to enrich peoples’ lives, this is unacceptable. A new kind of technology: wood-plastic composite. 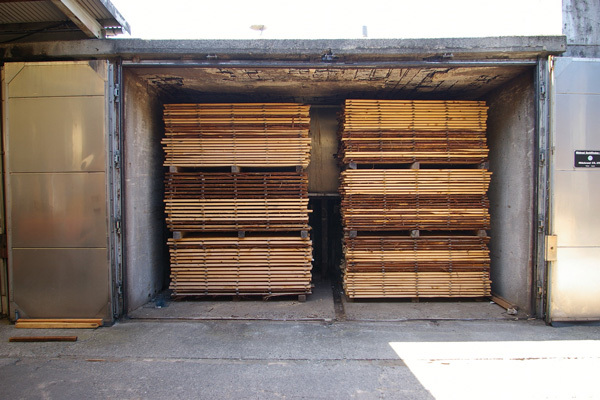 As the natural drying process takes up to six months to a year, at Eto, we dry our wood using a steam type dryer, which is less damaging to sawed wood, compared to other artificial drying methods. And because the process takes only three to four days, the wood retains its oil content for a brilliant shine. Eto’s motto is: “All the natural charm and functionality of wood, with added strength and beauty.” In order to realize this vision, we are embracing new technology. Composite resin is injected inside the walls of the wood cells, reducing the flexibility of the material for increased strength, beauty, and resistance to decay related deformation, while maintaining natural absorbency. This new materials is called wood-plastic composite. As a well established furniture, housing, and timber manufacturer nearing our 100th anniversary, we intend to continue accepting new challenges in the future. which is resistant to water. From this we select only high quality prime grade wood. 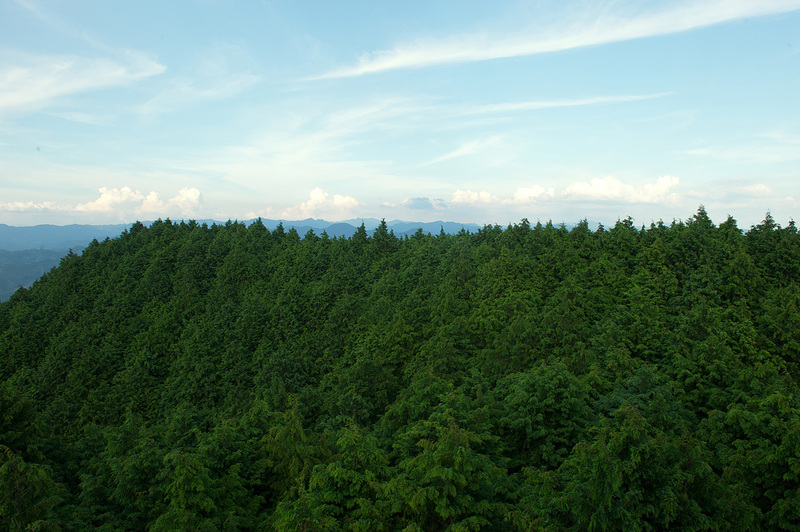 At Eto, we use only cypress grown for decades in the warm climates of Kyushu and Kumamoto for our construction materials and furniture. With its high oil content, this wood repels water, and is resistant to decay. 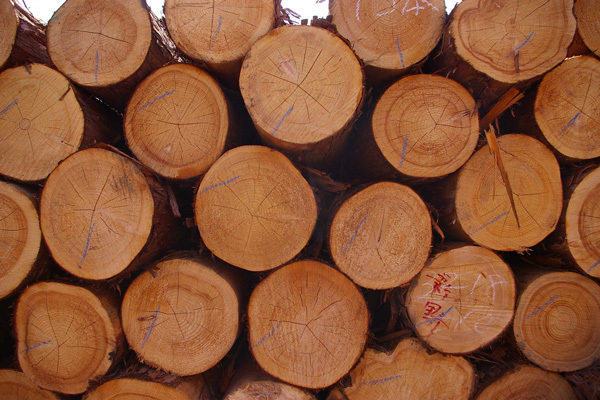 From both timber collected during forest thinning and logs harvested systematically from plantations upon reaching maturity, we choose only prime grade wood, high quality wood with few knots. 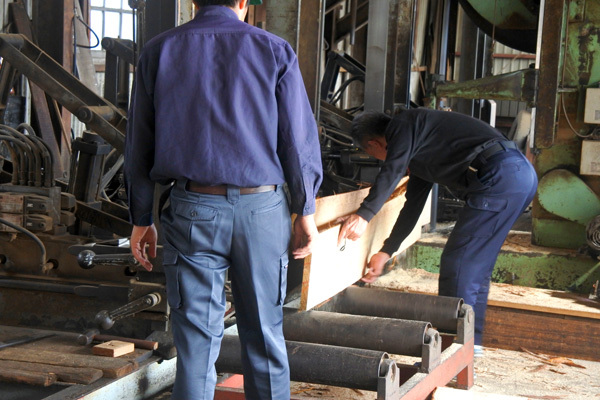 We then inspect each of the logs before sawing them into the size and shape suitable for their intended use. While knowing the source and history of our materials is important (we select materials with high traceability), we also have our own unique standards regarding appearance and quality, and only use materials which meet these standards. 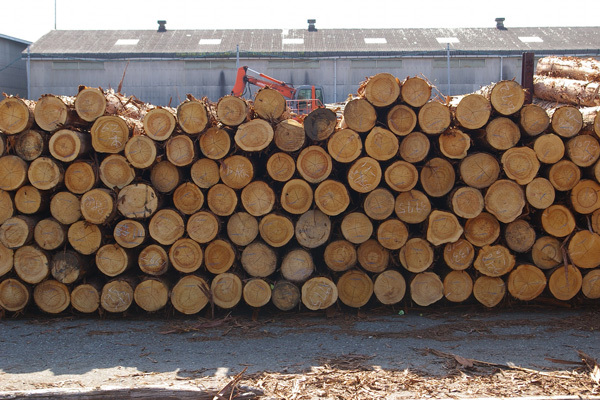 We employ different management practices at the sawmill for wood to be used for construction and that for furniture respectively, and, for example, may use a piece of wood with no knots for an area for which appearance is important, and a piece with small knots for the other side, thus making optimal use of our natural resources.